At Jim and Jan Gardner’s home near Los Angeles, hundreds of varieties of mature succulents and low-water companion plants pack a colorful, well-thought-out landscape. A retired MD, Jim’s the “succulent guy” at nearby South Coast Botanic Garden and an art potter as well. For over 40 years, the Gardners have lived in Rolling Hills Estates on the Palos Verdes peninsula, which juts from the coastline like a burl on an oak. It’s a highly desirable habitat for people as well as plants, and a great place to view large specimens. Tropicals and succulents have thrived in this mild, maritime climate for as long as nurseries have offered them. Palos Verdes peninsula, southwest of LA. The red dot indicates the South Coast Botanic Garden. Jim is a self-described “biophile:” a person who enjoys interacting with nature’s life forms. “They stick to me,” Jim says of his collection of 1,300 potted succulents and cacti. Many are in containers made by Jim himself, who after 30 years in internal medicine at Kaiser’s South Bay Medical Center, became an artist-potter. His sought-after work is characterized by textures derived from organic items such as pine cones and tree bark. A long-time Cactus and Succulent Society member, Jim volunteers at nearby South Coast Botanic Garden. His pots are available at the gift shop and the annual two-day Cactus & Succulent Show in April. Jim makes it look easy to grow 20-foot tree aloes, airy epidendrums and sofa-sized deuterochonias (a spiky, colony-forming bromeliad), but like any avid biophile, he’s made his share of mistakes. Years ago, for example, when applying herbicide to an invasive grass, Jim sprayed his succulent euphorbias as well. “They turned to mush,” he recalls wryly. “Out in front,” he adds, “I trimmed the lavenders too vigorously and killed them, so that’s how these plants happened.” He gestures to a streetside garden lush with aeoniums, aloes and shrub euphorbias. Pavers that traverse the area appear grouted with dymondia, a low-water ground cover that withstands foot traffic. Other waterwise ornamentals include tower of jewels (Echium wildpretti), with conical, deep pink, 5-foot bloom spikes; and a trunkless burgundy cordyline with white flowers that suggest shooting stars. Btw, Jim collects and hybridizes mangaves (Manfreda x Agave hybrids). You’ll notice these intriguing dotted and speckled succulents in some of my photos. 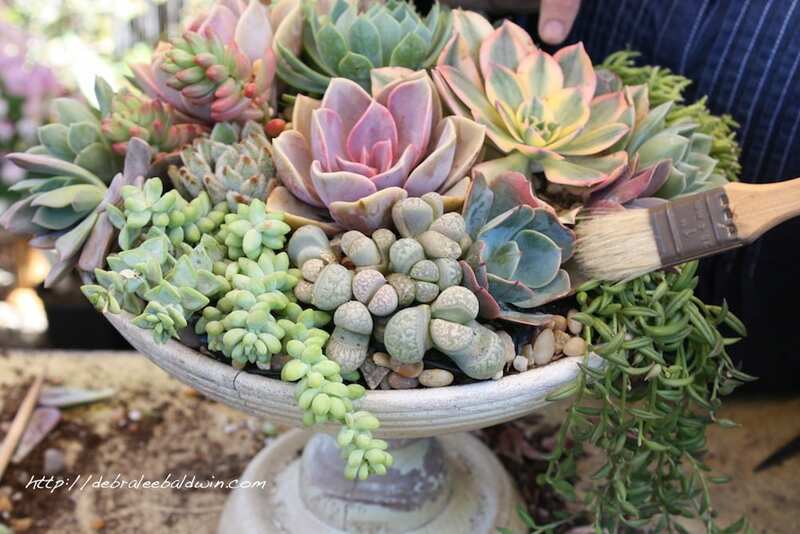 Watch for a future newsletter about these increasingly popular succulents. See if they don’t deserve a place in your own collection! And now…drum roll…here’s my annotated gallery of the Gardners’ garden. As with all the photos on my site, you’re welcome to download and use these, providing the photo credit remains intact. Debra…Thank you for your efforts and sharing your love of succulents. You are truly an inspiration and an encourager with your expert knowledge. Jim, your passion is evident, it shows! Thank you both for sharing!!! Hi Suzy — Thank you for the lovely comment! Jim was so gracious to share his garden and expertise.